Pelican Plunge Castaway Cay is the fabulous Disney Cruise water slide located on their private island. 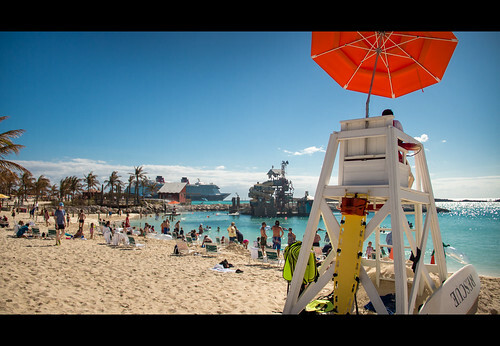 Most Disney Caribbean and Bahamas cruises have a port stop at Castaway Cay. 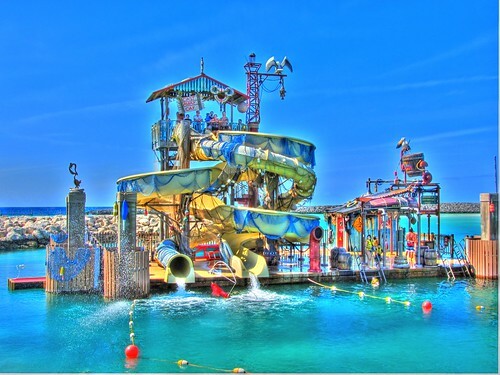 You are certainly going to want to explore Pelican Plunge on Castaway Cay – it is a whole lot of fun! 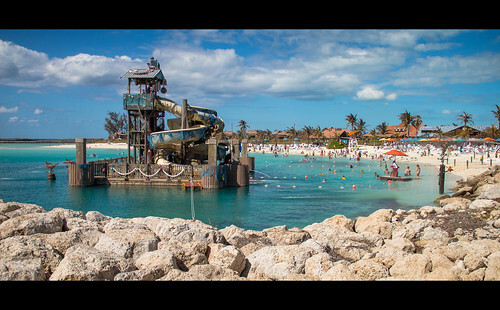 Pelican Plunge is located on the Family Beach at Castaway Cay. It is a short walk from the ship or you can take a tram to get you closer if you do not want to walk. We suggest walking in the morning as usually it gets you to the Family Beach more quickly than waiting for a tram. It is also a pleasant walk to the beach. You really can’t miss Castaway Cay Pelican Plunge. It is a huge structure out in the bay. It is a floating platform – and at 2,400 square feet there are a lot of features to enjoy on Pelican Plunge. The surprising thing about Pelican Plunge is that you have to swim out to get to it. Of course if you think about it then it has to be this way. The water at the bottom of a water slide has to be of sufficient depth to be safe to exit it. Castaway Cay water gets deeper as you swim out, so it has to be out there. However, the annoying thing for some may be that you expected your little ones to be able to use Castaway Cay Pelican Plunge and they can’t. You have to be able to swim a decent distance to get to the platform. Life vests are available for everyone, but you are not going to be able to let your small children go out there alone. There are two slides on the platform. Everyone joins one line and then when you get to the top you decide which of the Pelican Plunge slides you are going to try. The enclosed slide is the least popular one. It is pretty dark and you do not really get a sense of where you are going. We avoid this one after attempting it once, but we are definitely on the cautious side of anything so don’t let us be your guide on that! The other slide is open and is 140 feet long. This is much slower than the enclosed slide option and we think it is much more enjoyable. If the line is long you will be in the sun for quite a while. As you reach the stairs there is more shade. As we all areas of Castaway Cay make sure that you use sun screen. We can’t say that often enough. Keep putting on the sun screen or you are going to regret your mistake! A very common question is what is the Pelican Plunge Castaway Cay Height requirement? You have to be at least 38″ to go on the Pelican Plunge water slide. If you are between 38″ and 48″ you can ride, but it is compulsory to wear a life vest. These are provided. Remember that the platform is a good distance out from the shore so you really won’t want your your child being out there unless you are going yourself. You can’t ride on the slide with them. If you do want a younger child to ride the slide we suggest that you go down the water slide first and wait for them at the bottom. Will you be heading to Pelican Plunge Castaway Cay?